*On a recent momentous occasion celebrating the first time ever recordings of the entire August Wilson American Century Cycle, a staged reading of “Joe Turner’s Come and Gone” took place at The Greene Space of radio stations WNYC and WQXR. Viewers across the country and around the world will be able to watch via live video webcasts at www.thegreenespace.org. Tickets for the live readings can be purchased at www.thegreenespace.org. Cultural partner Two Rivers Theater in Red Bank, NJ, home to many productions of August Wilson plays, will also offer live video webcasts at www.trtc.org. WNYC 93.9 FM will broadcast select recordings on Sundays beginning in January 2014. WNYC will also make the recordings plays available for radio broadcast on other public radio stations. Ruben Santiago-Hudson, Artistic Director, initiated the query session with a fitting tribute. “It’s just time for us as African American artists to embrace what belongs to us and disseminate it into the nation and the world because you can’t name something that belongs to us more than August Wilson. He wrote this body of work to celebrate the culture of a people. It’s an extraordinary responsibility to lead this historic undertaking of documenting and preserving for generations to come not just the words, but the sound of August’s majestic ode to African American life in the 20th Century. Sitting next to Santiago-Hudson were Taraji P. Henson (Molly Cunninghan), S. Epatha Merkerson (Betha Holly) and “Joe Turner’s” director, Phylicia Rashad. I asked Henson, who is starring in one TV’s most entertaining and smartest series, “Person of Interest,” what drew her to the project? “When Ruben calls, you say ‘yes,’” she laughed. “But when you mention the name August Wilson,” she continued, “to me that’s my Shakespeare. When I was introduced to August Wilson, I felt I was home. I felt (she gasps) his words. It didn’t matter if it was written before I was even thought of, the words still felt very close to me. Studying Shakespeare, Euripides, or whatever didn’t make me feel as comfortable or alive. Phylicia Rashad (“The Cosby Show”) praised August Wilson for his literary distinction. 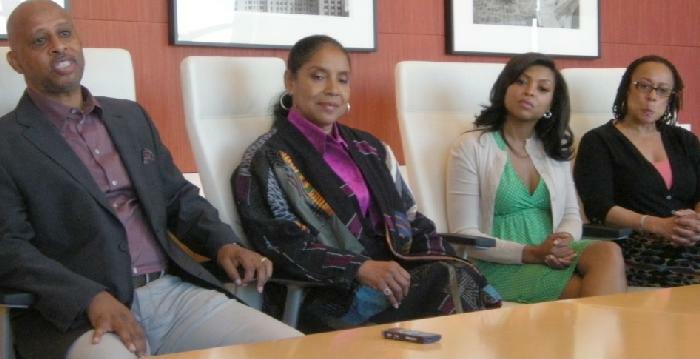 “I grew up with a poet and playwright, my mother, Vivian Ayers,” Rashad imparted. “So I have great respect for the discipline of writing. I have great respect for the power of the written and spoken word, and I’m trained in theater arts…The thing that I find unique about August is that he was determined that his plays would be produced on Broadway stage and in doing so what he did was he elevated the salt of the earth people to the Broadway stage.